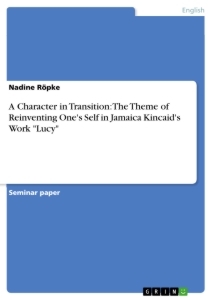 A Character in Transition: The Theme of Reinventing One's Self in Jamaica Kincaid's Work "Lucy"
The autobiographical novel Lucy was written by Jamaica Kincaid in 1990. The author, who was born in 1949 on the Caribbean island of Antigua, is one of the representative figures of postcolonial literature, which has been gaining prominence since the 1970s. With the apppearance of the work “The Empire Writes Back: Theory and Practice in Post-Colonial Literatures” written by Bill Ashcroft, Gareth Griffiths, and Helen Tiffin in 1989 the popularity of the term “Postcolonialism” grew even more. The definition of the term is still widely discussed but in general postcolonial literature deals with the effects of colonization on the colonized people and society after the end of colonization. The term “post” indicates that Postcolonialism is relating to the time following the establishment of independence in a colony. That means, the time after the colonial powers have left the country and the time of colonization is over. Nevertheless, the issues of Postcolonialism are so many-sided that they often transcend a strict definition of the term, which is therefore used much more loosly in practice. Postcolonial themes not only discuss the period after the departure of the imperial powers but also deal with the time before independence. Major issues are the oppression of the indigenous people by the imperial powers, the gaining of independence, the impact of colonization on postcolonial history and culture, the search for personal and national identity but also the economic dependency of the postcolony on its former colonizers. Thus some critics even question the term Postcolonialsm, since it indicates that the period when the colony was dependent on its colonizers is over. They argue that most former colonies are still or even again economically dependent on the mother country that colonized them. Those neocolonial forms of oppression and exploitation are probably caused by globalization, which means by the increasing mobility of goods, services, labour, technology and capital throughout the world. Postcolonial literature comprises authors from Africa, Canada, Australia, India and the West Indies. Caribbean literature often deals with the process of coming of age, which is not seldom presented in an autobiographical mode, the discussion of migration and exile as well as the search for identity. These issues can be found in Jamaica Kincaid`s Lucy as well. In the course of this work I will try to examine how the protagonist reinvents herself in the novel. After a short introduction into the autobiographical background to Lucy, it will be necessary to take a closer look at the cultural location of the novel and its impact on Lucy’s endeavour to find her own identity. I will discuss concepts of hybridity and in-betweenness, which can be found in the novel and try to relate Lucy’s relationship with her mother to the problems she encounters with establishing her own personality. Jamaica Kincaid described her work Lucy as autobiographical. The novel is based on the author’s experiences as a young au pair in the United States. Some critics even blaimed Kincaid for having borrowed too closely from the details of the lifes of her first employers. Although Lucy tells Kincaid’s own story, the novel is far more than merely an autobiography since the authors experiences are representative for other black Antiguans. Thus Kincaid tells not only her personal story but the story of many other young people emigrating from the Caribbean and coming to the United States. Kincaid herself was only sixteen when her parents sent her to the United States as an au pair because they were short of money since her stepfather had to give up working because of his health. They thought that this would be a wounderful opportunity since her mother always wanted her daughter to be more English like, a wish that Kincaid could not understand let alone fulfill. Nevertheless, since she was a child it has always been her dream to go to the United States. So in 1965 she left Antigua and went to Scarsdale, a suburb of New York, where she worked for the Masons. She described her employers as being very nice and protective but nevertheless she felt depressed and hopeless in the place she had always wanted to be more than in any other place. After just a few month she left the Masons and went to Manhatten where she worked as au pair for the writer Michael Arlen. She staid in the family for three years. During this time she obtained a high school equivalency diploma and began to take courses in photography at the New York School for Social Research. In 1969 Kincaid left Manhatten for Franconia College in New Hampshire, to which she had won a full scholarship to continue her photographic studies but within two years she left the college without completing her degree because she felt too old to be a student, although she was only around twenty years old. During all this time she had no contact to her mother and like Lucy she left her mother`s letters answered. Lucy’s full name in the novel is Lucy Josephine Potter. Potter was the surname of Kincaid’s real father, Roderick Potter, with whom she did not have a close relationship since she was only one out of many illegitimate children. Her father was neither married with Kincaid’s mother, nor caring for their mutual child. This problem occurs quite frequently in Caribbean society and is discussed in Kincaid’s novel as well. Until 1965 Kincaid lived together with her mother, Annie Richardson Drew, who was a homemaker and one-time political activist and her stepfather, David Drew, a carpenter. Kincaid’s grandmother was a Carib Indian, who came from Dominica, where she and her husband had been landpeasants. This fact occurs in Lucy as well when she states that her grandmother was a Carib Indian after Mariah told her that she also has some Indian blood in her. Concerning Lucy’s early opposition against the colonial powers, even more parallels can be found. Already as a child, Kincaid opposed those she felt suppressed by. She despised the subservient behaviour of the islanders to Antigua’s British colonizers and reacted to the humiliations of everyday life with a distinct forthrightness and rejected to acknowledge any hierarchies that put her or other natives in a lower position. Her teachers regarded her boldness as rebellious behaviour and often punished her for her attitudes. Once she was forced to memorize long passages from John Milton’s Paradise Lost. Having pointed out the parallels between Jamaica Kincaid`s life and the experiences of the protagonist in the novel, it becomes obvious that although Lucy is a work of fiction, it should be read in a more political way and not only as a story of an individual. Lucy is the story of a young Caribbean woman who comes to the United States of America to work as an au pair for a white wealthy family. The novel starts with Lucy arriving in the New World, feeling the difference between the place she comes from and the place she is now. This difference is established by Lucy experiencing the different climate that she is not used to. Although the setting of the novel is New York there are numerous flashbacks to Lucy’s home island Antigua. The novel can therefore not be set in a distinct cultural location but is rather situated between two very different cultures, since the setting constantly shifts between the United States and Antigua. Lucy comes from the West Indies and her history is therefore connected to the history of colonization, slavery and racial heterogeneity. The postcolonial situation of the Caribbean islands is in some points even worse than those of other former colonies since the indigenous Caribbean people were wiped out after the arrival of the colonizers and replaced by African slaves and a small number of Europeans. In this sense it is even harder for the people of the Caribbean islands to find out what their own culture is like. Nevertheless, Lucy is aware of her Caribbean heritage and in her first gesture of resistance which takes place when the maid challenges her to dance, she turns to west Indian culture as a weapon since she starts dancing according to West Indian roots. But she is as well conscious of the fact that West Indian culture does not allow her to develop as she wishes to . In Antigua she felt trapped in a role that she did not want to play and she always imagined America to be the only place on earth to be free. Thus it had always been her dream to come to the United States but she is disappointed right from the beginning. On the way from the airport to her new home she sees “all these places [which] were lifeboats to my small drowning soul” when she was still in Antigua and which now “looked ordinary, dirty, worn down”. Something happens to Lucy that she had never imagined possible while at home: she feels homesick. Kincaid, Jamaica, Lucy (New York: Farrar, Straus, Giroux, 1990), 6. The Confession of Self-Deception in Elizabeth Bishop’s "One Art"
Lucy Grealy’s "Autobiography of a Face" and A.M. Homes "The Mistress’s Daughter"